Travis Picking is the sound Heard 'round the World! A Complete Travis Picking Lesson WITH Video Guitar Lessons. Nearly everyone has heard Travis picking on the guitar. That steady,bass driven style of guitar picking has been featured in nearly every kind of popular music that uses a guitar. So everybody's heard this kind of guitar picking, but what is it, exactly? In a nutshell, it's a chord based style of playing that has a pronounced alternating bass. It was developed in Kentucky and popularized by Merle Travis in the 1940's. To Travis pick the way that Merle Travis did is probably the hardest way to do it. His style was so unique that it's hard to copy exactly. Travis did several things that are tough to copy. For starters, he used his left hand thumb to fret the 5th and 6th strings. Doing this let him play chords that couldn't be fretted any other way. With his right hand he just used his thumb and his index finger. He kept his middle, ring and pinky planted on the top of his guitar. The way Merle Travis Travis picked isn't how everybody else Travis picks. The rest of us don't have a "bionic" thumb and finger like Merle. We have to make do using the thumb, 1st, 2nd, and maybe even, the 3rd finger. We'll just have to fake it! The most important thing to keep in mind with Travis picking is that your right hand thumb has to work as steady as a clock. The best way to develop that is to work your thumb by itself. This is good T.V. practice. Alternate playing 6th string,4th string, 5th string, 4th string. Then for variety, play 5th string, 4th string, 6th string, 4th string. What does this have to do with the T.V.? Just this. You need to practice working your thumb until you think your thumb's going to fall off. Practice until you can do it while you're watching T.V. and not miss a beat. Also, let's face it, this repetitive kind of physical practice can get to be a little boring. Watching T.V. might make it a little more interesting. O.K. Now you've got your right hand thumb ticking like a Timex watch. What are you going to do with all of those extra fingers on your right hand? Start out by assigning your 1st finger to the 3rd string, 2nd finger to the 2nd string and the 3rd finger to the 1st string. Work on playing the patterns in the examples below. Set your metronome slow enough to play the examples without making any mistakes. Accuracy is more important than speed. Play the 6th and 5th strings on the beat and the 4th string on the "and". The bass part will sound like boom-chick, boom-chick. This approach to playing has a real Chet Atkins-y sound to it. There's a good reason for that. Chet was influenced by Merle Travis' playing. Merle was a big radio and recording star and had a major impact on many guitarists, including Chet Atkins. In fact, you can think of Chet's playing as being a more refined form of Travis picking. One of the things that gives Travis picking its drive is muting the 5th and 6th strings with the heel of your picking hand. To palm mute, place the heel of your picking hand on the 5th and 6th strings at the bridge. When you pick those two strings you want to hear a thud, not a clear note. The trick to it is muting the 5th and 6th strings and not any of the other strings. To learn to do that will just take a little experimenting on your part. Move your hand around until you're getting the sound that you want. Using a thumb pick will really help you to get that classic Travis picking sound. Here are some things to look for in a thumb pick. Number 1 is fit. It needs to be a tight enough fit not to turn on your thumb but loose enough not to cut off the circulation. You can't very well Travis pick if your thumb is numb! Fit will be decided by where on your thumb you wear the pick. This will range from the thumbnail area up to the 1st joint of the thumb. I have noticed that the players that have a lot of power in their thumbs tend to wear the pick higher up by the 1st joint. In fact, Merle Travis wore his thumb pick up at the 1st joint. Another factor is what the pick is made of. By that I mean what kind of plastic. I've found that thumb picks that are made out of Delrin tend to not crack along the back of the thumb loop and they produce a warmer sound. Fred Kelly makes Delrin picks in several different varieties and I'm sure other manufacturers make them too. The last factor is the shape of the blade. Again, this is purely personal preference. I've found that a thumbpick that has a shorter blade is more likely to be on the same plane as my picking hand fingertips. It's also less prone to dig into the strings too much and get tangled up. It will still give you enough blade to get a big thump when you're Travis picking. You can use Travis picking to accompany yourself singing or to play solo guitar instrumentals. The biggest difference will be what chord form, or inversion, that you use. If you're using it for accompaniement, you'll mainly use a chord form that will have a pleasing quality with your voice and is easy to grab, or one that has the melody note as its highest pitch. If you're playing an instrumental you'll choose a chord that has the melody as it's highest pitch. Travis picking is a simple concept. The only tough part is training your thumb. Stick with it, you CAN do it! 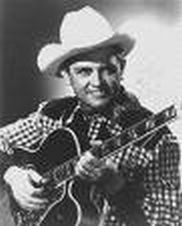 There are a ton of recordings and instructional methods available about Merle Travis. The instructional DVD by Thom Bresh (Travis' son) is especially good. Check out the Picking Travis section below the video. It's a collection of suggested recordings, DVDs and thumbpicks that I've put together. All of the material in Picking Travis is available through Amazon.com. Since they sell globally and have a very secure payment process, I thought that they'd be a good choice for this.